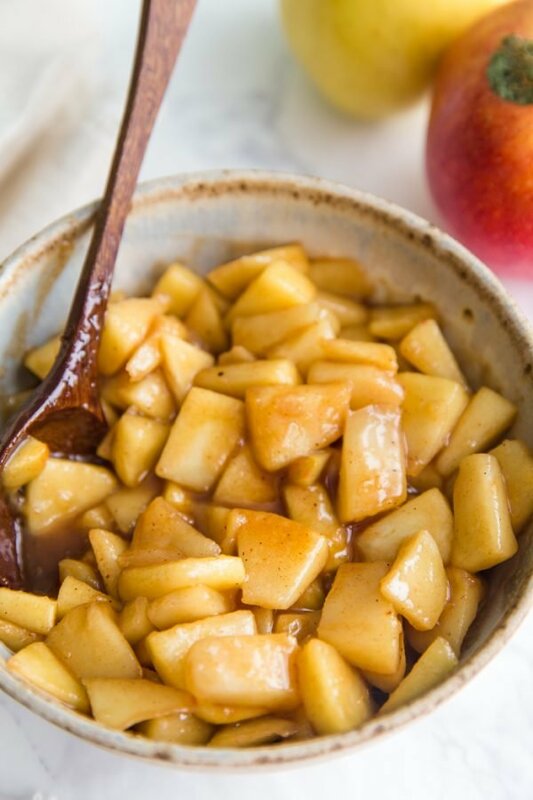 This Easy Sautéed Cinnamon Apples recipe has been my go to for breakfast lately! I like eating it with a bowl of oatmeal or on top of pancakes. What we have here today is essentially apple pie without the crust. 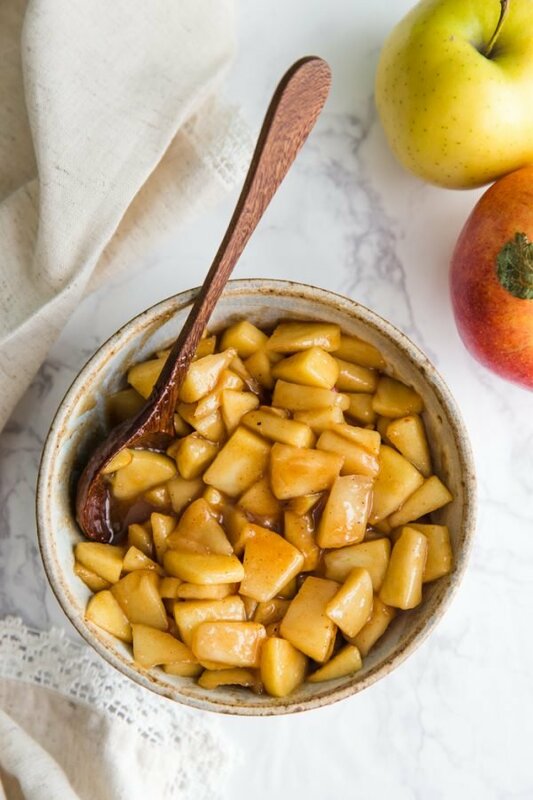 NOW I know that crust is sometime the best part of the pie but we have other plans for these Easy Sautéed Cinnamon Apples today. Such as….on top of oatmeal. Or put on top of waffles or pancakes. Or perhaps just served in a bowl with ice cream on top (!!!!). You get the idea. We’re doing things with these amazingly delicious sautéed apples. I’ve made a version of these apples for a few years now but usually the recipe consisted of me aimlessly throwing cinnamon and nutmeg and brown sugar in a pot and hoping for the best. More often than I care to admit, the apples ended up either way too sweet or not sweet enough. This recipe aims to fix that. ^^^^My current breakfast obsession! If you follow me on instagram– I plan to make this in my insta stories today! 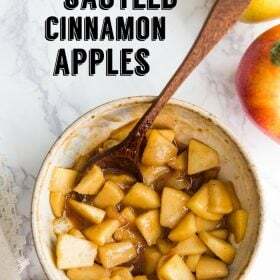 What I like to do is make a big batch of these easy sautéed cinnamon apples and then keep them in the fridge for snacks and breakfast toppers throughout the week. I’m not much of a meal prep-er but these apples are an exception to the rule! I wanted this recipe to be 1) quick and easy to prepare and make but also 2) a reasonable portion size so that, if you don’t want them, you’re not left with a ton of leftover apples. If you DO want the leftovers (the apples reheat very well) then you can easily double or triple the recipe. 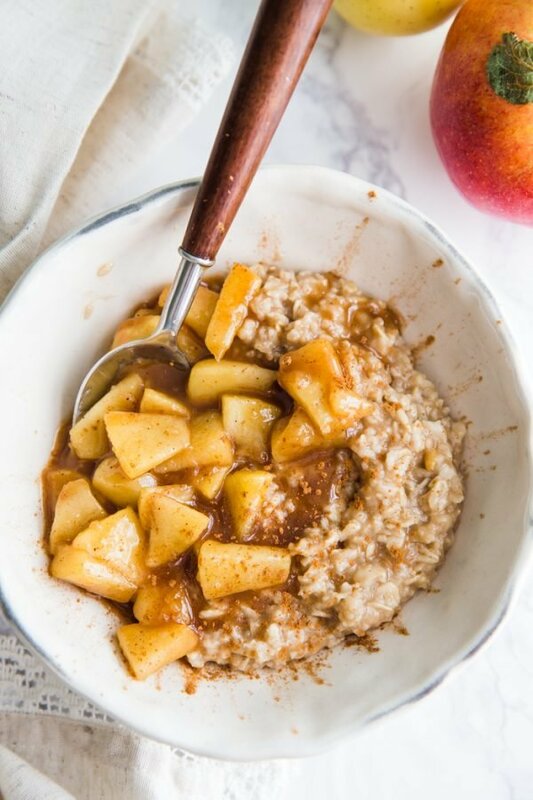 As written, the recipe makes the perfect amount of topping for 2 large bowls of oatmeal if you’re wanting a rather hefty portion of apples OR it’s good for 3-4 bowls of oatmeal if you just want a little in each bowl to mix in. Let me tell you how easy these cinnamon apples are: FIRST we’re going to melt a little butter in a saucepan and then sautee the apples in the butter until they’re nice and tender. This takes about 7-10 minutes (depending on how thick you cut your apples) and will make your house smell amazing! You could swap the butter out for coconut oil if desired. 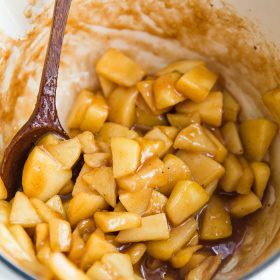 Once the apples are nice and tender and juicy, we’ll take the pan off of the heat and then stir in a cornstarch slurry, brown sugar, cinnamon, and nutmeg (+ whatever other spices you might so desire!). See! Simple and SO GOOD! Don’t forget to join me on Instagram today to see me making these Easy Sautéed Cinnamon Apples in my stories! I’ll save the stories in my highlights so you can see it later as well! Happy Wednesday! In a medium saucepan, melt the butter over medium heat. Once it’s completely melted, add in the apples and stir until they are fully coated in the butter. Sautee for 7-10 minutes until nice and tender to your liking. The cook time depends on the thickness of your apples. While the apples cook, stir together the cornstarch and water in a small bowl and set aside. 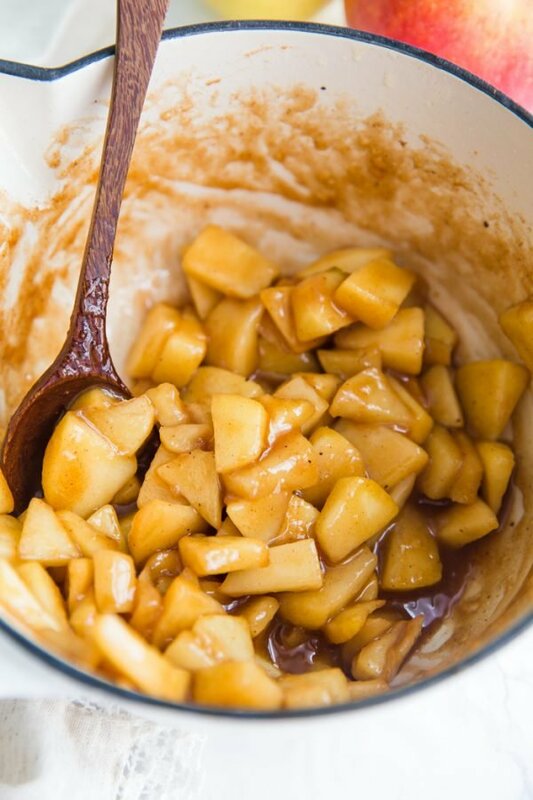 Once the apples are tender, take the pan off of the heat and immediately stir in the cornstarch slurry. Once combined, stir in the brown sugar, cinnamon, and nutmeg.